A United Launch Alliance Delta IV rocket carrying the Wideband Global SATCOM 9 communications satellite for the U.S. military lifts off from Space Launch Complex-37 of Florida's Cape Canaveral Air Force Station at 8:18 pm ET on March 18, 2017. 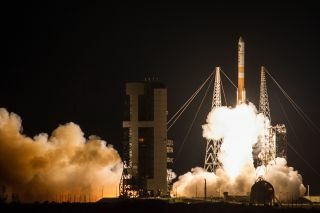 CAPE CANAVERAL, Fla. — A Delta IV rocket blasted off Saturday night (March 18) to deliver a $445 million U.S. military communications satellite into orbit, the ninth member of a planned network of 10 satellites. Built and flown by United Launch Alliance, the 22-story tall booster lifted off from Cape Canaveral Air Force Station here at 8:18 p.m. EDT (0018 March 19 GMT), soaring out over the Atlantic Ocean after a 34-minute delay to resolve an issue with ground support equipment. United Launch Alliance is a partnership of Lockheed Martin Corp and Boeing Co.
Once in position more than 22,000 miles (35,400 km) above the equator, the satellite, known as WGS-9, will join a constellation that provides the military's highest capacity communications service. A Delta IV rocket carrying the advanced WGS-9 military communications satellite for the U.S. Air Force streaks into space from Florida's Cape Canaveral Air Force Station in this long-exposure image taken on March 18, 2017. The spacecraft support both X-band and Ka-band communications, which are parts of the electromagnetic spectrum used for data transmission. The satellites can seamlessly cross the bands to accommodate voice, data, video and other types of communications over a broad range of ground-based and mobile terminals. In exchange for part-time use of the WGS network, Canada, Denmark, Luxembourg, the Netherlands and New Zealand picked up the $442 million bill to manufacture WGS-9. The United States has a similar partnership with Australia, which paid for the WGS-6 spacecraft that was launched in 2013.
International partners receive proportional access to the bandwidth provided by the WGS constellation based on financial contribution, the Air Force said.